I'm only scratching the surface! More cobbled mayhem all week! Enjoying your coverage of PR especially the old stuff on Bauer & LeMond! Glad to hear it! I am sitting on a mountain of material, and a little "project" that I can hardly contain myself about. 50/50 on me spontaneously combusting before Friday. echoing the above - cheers for the PR coverage! I'm like a child eagerly anticipating Santa's visit! 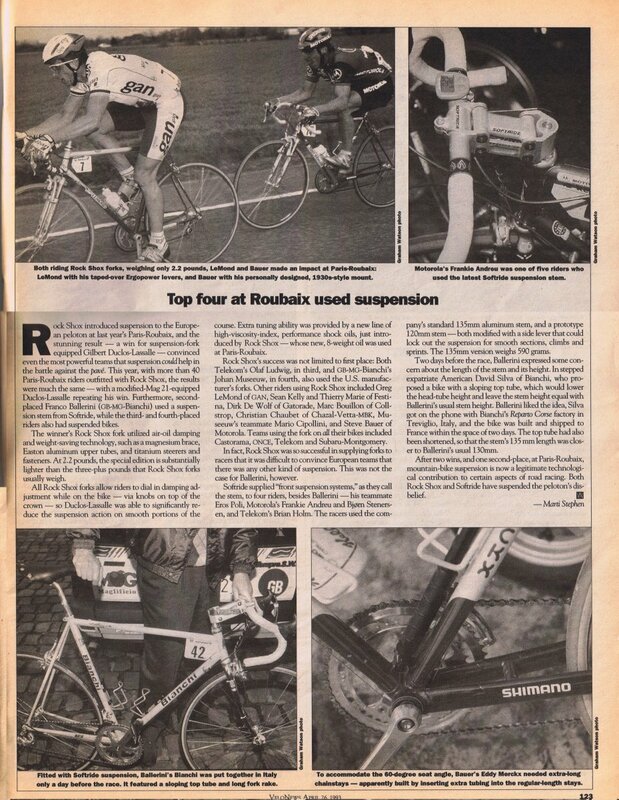 Very nice archive of Paris Roubaix articles. I have been searching for a photo of the Steve Bauer bike for a while. I can not believe he road that to a 21st place that year. One thing that I wonder is why they stopped using suspension. I seems they just dropped the idea all together. It must have helped quite a bit, especially on the front.